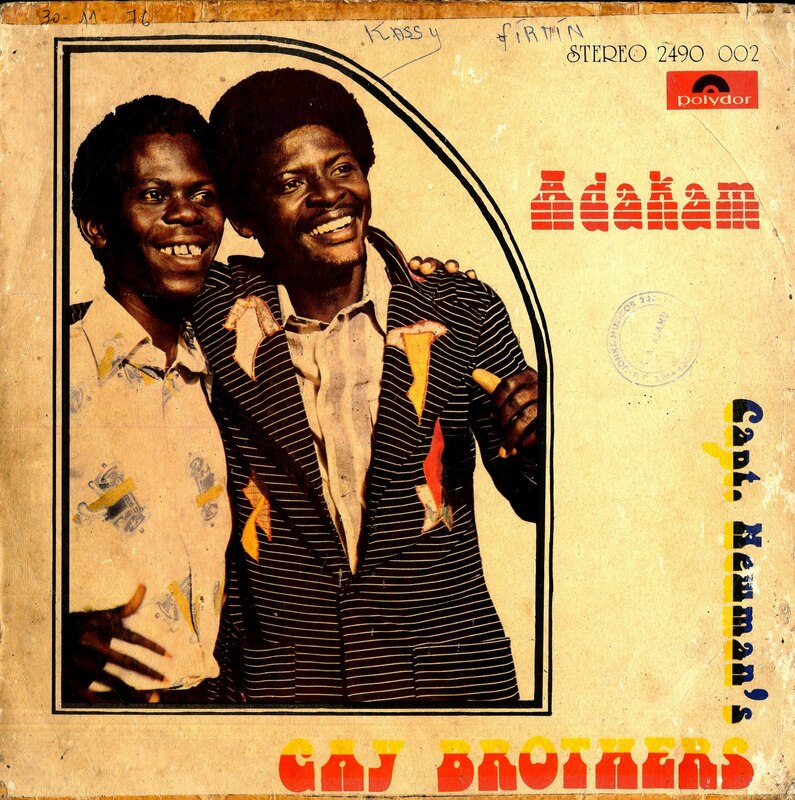 For the next selection on the highlife turntable I have selected the track Owu Aye Me Bone by Captain Newman's Gay Brothers. I came across my first Captain Newman Gay Brothers LP by accident when a cover did not match the record, but I liked the sound and started to collect everything I could find. It was hard to learn anything concrete about the band until I came across this Polydor release Adakam. 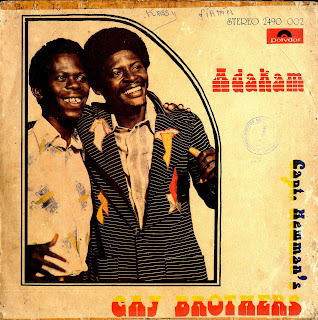 Captain Newman was a vocalist for the African Brothers and then joined Adu Kwesi (who is the gentleman on the left in the picture) and Oscar Tawia to form the nucleus of the Gay Brother's band. The liner notes go onto say That: In this album an attempt has been made to cross the rhythm on the Preprensua or Ashewa Box as played by Uncle Awotwi with the bass guitar featuring guest performer Eddie Donkor Snr. The resultant of this experiment is that much room is created for the bass guitarist to manoeuver and this is amply demonstrated on both sides of this album. And with a touch of lead guitar work by S.K. Oppong the exercise I would say is complete. I appreciate the patience of the Ghanaian music lover who follow this blog. I know it has been a while since I posted a Ghanaian track, but I hope this tune makes up for the delay. Great music, thanks for sharing. what a beautiful song! i need this in my life! are any of the songs on your blog downloadable? thank you so much for this!